Eight months course from July 2014 to March 2015. I have always loved martial arts, when I was little I used to watch a lot of kungfu movies. Just before I started high school I went to see a performance of the shaolin monks and that is when I decided that as soon as I would finish high school I would go to China to do train in shaolin kungfu. I wanted to learn the martial art in it's context and also be able to experience a completely different lifestyle and culture. During my stay at kunyu mounain academy I learned shaolin kung fu and a lot of things. I gained a lot physically, before coming here I did not practice a lot of sports but after just a few month of training I was satisfied to see that my stamina and my strength got a lot better. Before coming here I did not practice kungfu and I did not have any experience in shaolin forms and basics, when I see what I can do now technically I am very happy. The training was very intense and difficult but I learned that I can always push my self harder and that is my greatest gain here, I learned not to give up and to believe in my self. The most important person during my stay here was of course my shifu (master). He is the one that taught me every thing I know in kungfu, he was always ready to listen if I had problems. Of course all the shifus have their own style and personality but every one of them has a lot of experience and their own method of training. Even though my master Gao was not older,he had a lot of experience and passion. I am very proud and happy to have trained with him, he had a great personality and was very implied in the way his students trained, he made us work very hard and pushed us to our limit. During the months I spent here I met a lot of interesting people, I started training with strangers and left with a lot of very good friends. I could never had achieved so much if it wasn't for the people in my group who encouraged and helped me. 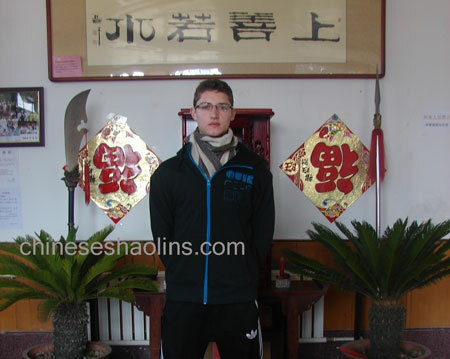 I came to this academy to do one thing: learn Chinese Kungfu, if your goal is the same as mine, the academy is perfect. The timetable may be a bit hard in the beginning (get up at 5:30 am if you want to do tai chi, 5 hours of training a day, bed time at 9:30pm) but once you get used to the daily life you will be able to enjoy your stay. The surroundings of the academy are very nice, the air is clear and the nature is beautiful. It is a good environment for training because there are not a lot of distractions nearby, for this you can go to Yantai. If you come here during summer you can go swim in the little lake nearby which is nice.If you come during winter,you will need bring some warm clothes. As I said earlier, all the masters that where present while I was staying here were very good, I recommend my master if you want to push your limits and become a sanda/Chinese kickboxing best ! The translators I met where all kind and helpful, I always thought they made a wonderful job.